Home / 2018 Interactive Bird a Day Desk Calendars! If you have family, friends, and co-workers that love birds, we have the perfect holiday gift for you! “GIVE AND GET” FACEBOOK OFFER: BUY 2 GET 1 FREE WATERFORD POCKET GUIDE! The Bird a Day 2018 interactive daily calendars are the first page-a-day desk calendar series that showcases birds where people live. Just like our field guides, we created Bird a Day in two regional editions — Eastern/Central North America and Western North America. Both editions include gorgeous photographs of common birds from the Cornell Lab’s photography community, the latest range maps, easy reference icons (i.e., Habitat, Food, Nesting, and Behavior), and fascinating information on each species. We also share special bird and conservation days throughout the year and “get out there and go bird watching!” weekend ideas and activities, with some of our best bird-watching advice and tips from the Cornell Lab. Bird a Day also works with our free downloadable BIRD QR app to listen to HD bird sounds on each species page and learn more. “GIVE AND GET” FACEBOOK OFFER: BUY 2 GET 1 FREE WATERFORD POCKET GUIDE! 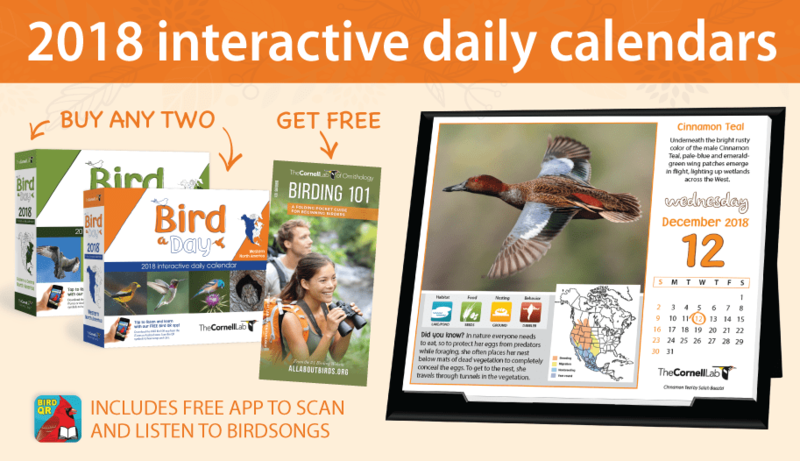 Start your birding year right with our NEW 2018 Interactive Daily Calendars! Buy any two and add one of five Waterford pocket guides as a stocking stuffer, for free! (A $9.95 value! Pick from these titles: Birding 101, Right Bird, Right House, Gardening for Birds, Nests & Eggs, or Bird Feeders & Food.) Use promo code: WATERFORDHOLIDAY, valid through 12/31/17). Your per calendar discount will be applied that totals to one free Waterford pocket guide for each two purchased automatically.